There are no atheists in Foxholes, just some turkeys amongst the eagles. Nothing will get the attention of man and beast more than being in the middle of a life and death situation. Many laugh about the stupidity of the turkey and claim the fowl is so dumb that during a rainstorm they will keep their mouth open, while looking up, until they drown. However the fact is, while a turkey is a pea-brain, its eyes are set on the side of their head. They are incapable of looking towards the heavens during a storm. In most cases, they are killed by their lack of wisdom and inability in finding a good refuge. On the other hand, an eagle knows when a storm is approaching long before it hits. An eagle will not run from a storm, but will perch and watch for it from a great height. When the treacherous weather begins, the eagle will position its wings so that the harsh winds will pick it up and lift it above the storm. As the storm rages below, the eagle will soar above it. The eagle does not escape the storm. It uses the storm to lift it to new heights. One can’t see the forest while standing in the middle of it and I couldn’t see the reasoning and blessings God had in store for me when being battered and struck by a tornado in April of 2006. This was a devastating blow I did not see coming. I even laughed as I grabbed my sneakers on the way to the basement and said out loud, “I might need these if we get hit. I wouldn’t want to be in high-heels all day.” I had no idea the ruble I would find myself standing in, in just a short time. If you have ever experienced and survived a catastrophic event, it should become a monumental time in your life, something you learn from, life changing. It certainly was for me. I learned that in the chaos, God is not only with you, but He has a purpose, many purposes for it. In my case, God continues to slowly reveal a variety of purposes for allowing the hurtful things I have experienced, which I was incapable of seeing at the time. I didn’t have and still don't have God’s perspective of things. I was at such a great place in life in 2006, or so I thought. I vividly recall the many times, upon returning from retrieving the morning newspaper, when I would stop halfway up the driveway of our sprawling estate to give thanks for my many blessings and for what God had brought me through and to. My marriage had survived many assaults including financial devastation, plots of division, wounds from adultery and years of infertility. God had finally blessed us with a healthy son, and for the first time in almost 20 years together we were living by ourselves. God had been pouring His financial blessings upon us as well. My husband had reunited with his singing and business partners. We had a beautiful home, Golden Era Plantation, which was finally debt free, and I had just purchased my first Mercedes. Everything was grand, no need to change a thing. At the time, I was living life like a turkey. I only saw what was directly around me. I did not have a clear overview of unseen things or the wicked storms which were forming on the horizon. That beautiful Thursday morning began like most every day. We had our list of things which needed to be done and appointments which needed to be met. I remember being a little put off that our “Mac Daddy” motor coach had not been delivered back to us from being serviced as promised the day before and it was an added thing to check on. Little did I know that was one of God’s many timely blessings. We were on our way back to our home after having lunch out, when my cell phone rang. It was my brother. He warned me of a storm, he had been tracking, which projected to come right in the middle of our property within minutes. He demanded that we get home quick and go straight to the basement. Like a turkey, I looked out the car windows as I drove through the gates and didn’t know why my brother was so alarmed. It was not stormy around us. As we got out of the car, our dogs met us and were jumping and barking in a panic. They were quick to run in passed us for shelter as soon as I unlocked the front door. I could not understand what all the fuss was about. It was barely sprinkling outside and the skies around our Golden Era Plantation were not dark at all. I had no doubt that we were going to be fine. By the time we made it to the basement everything had quickly changed. The winds had become violent, tossing large oak trees down our driveway like they were trigs. A green haze hovered over our property as the roof was being ripped off. With a snap of the fingers our ears instantly stopped up and our eyes began to bulge from the pressure. We were in a vacuum. A great catastrophic power was present and it left me awestruck. A feeling I had never felt before nor since. As I grabbed my son, Solomon, up and ran to the basement bathroom for cover, I knew instantly what we needed to do. I shouted over the roar, “We need to pray!” Solomon and I fell to our knees, knees to knees, face to face. His dad stood in the doorway. I called out to the Lord three times, “Jesus, Please protect us. Please put your arms around us!” Those are the words I kept repeating to our Savior as the muffled sounds of explosions and swirling winds encircled us. My son, who was four and half at the time, was in shock. He kept his eyes upon me and watched how I was responding to the situation. Because I was not crying, he was not crying. Because I was praying, he was praying. Because I was kneeling, he was kneeling. In times of crisis, our children are watching our reactions. We are teaching them through our actions, whether we realize it or not. In times of crisis, one’s core and muscle memory, or lack of one, is revealed. Muscle Memory is when a movement or action is repeated, over and over again, until a long-term impression is created to the point where it is performed without conscious effort. What you do on a day to day basis during good times will kick in when you are hit by one of life’s storms. When you have an on going conversation with the Lord, when you turn to HIM for daily direction, then that muscle memory automatically kicks in when you are being assaulted. You build that muscle memory ministry with God during the sunny, calm and peaceful days, so it is strong when you are at your weakest. In a split second everything that seemed so important no longer was even significant. I realized at that moment how fleeting life is. How everything can be changed, for good or bad, in an instant and just how powerful and protective our God is. If someone would have told me, that tragic day, that God was going to bestow blessings from devastation, give me joy for my mourning, praise for my despair, that God was going to show me favor, I would have questioned, “HOW?” Over time, I have seen so many blessing which have come from that day of destruction. I realize now that God had HIS arms around us, just like I prayed. God took me by the hand and slowly walked me through the year long process of cleaning up, restoring and rebuilding our lives. He also sent HIS earthly angels to help us along the way. I learned that sometimes things have to be torn down, so they can be built up stronger and more valuable. While God does not cause all the storms in life, HE can take it and bless you through it. The strong winds that day revealed things to me that I would have never known other wise. It revealed kindness from strangers, friends I didn't know I had and made me rearranged my life's priorities. Our large storage building was one of the things that was completely demolished. It held things that were stored for decades. Everything in it was strewn all over the yard and even lodged high in the trees. While all this mess caused us to get rid of a lot of clutter, which we didn’t need and was not useful, there were also things I discovered which opened my eyes and gave me a better understanding. Things so well hidden that it took a tornado for me to discover them. 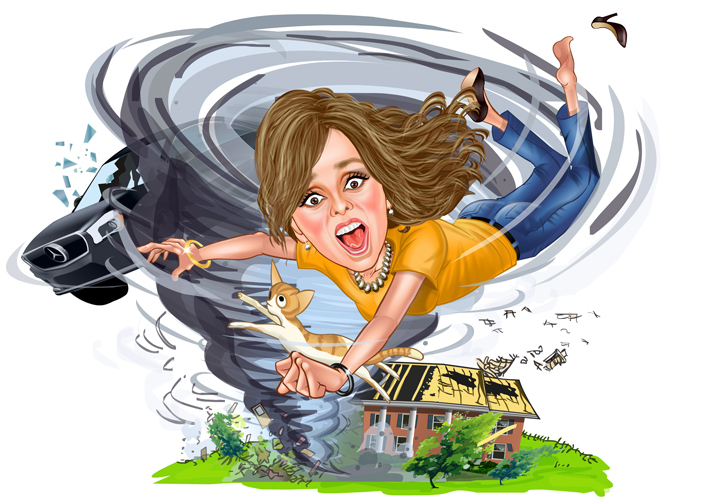 God put things in motion that day which later benefited my son and I in many ways when a different storm hit our family, several years down the road…divorce. You see, God had a clear overview of things, things I didn’t see. HE saw what was taking place and what was to come. God sees what you don't see. HE knows ALL. As difficult as your situation is, God is making a way when there seems to be no way. God loves us too much to leave us living life like turkeys. He wants us to soar like eagles. God has taught me, through all my tornadic experiences, many valuable lessons. I have learned how to rise above the chaos and to look to HIM for strength and repair. I've learned to trust and have faith in HIS plan for me. One of the purposes for all the direct hits on our lives is to build our empathy so that we know how to comfort, what is helpful and how to encourage others physically, emotionally and spiritually when we see them take a direct hit. What is your survival list? This eagle has stopped acting like a turkey and started flying above the storms. May God be with us all and may we all take refuge in God.